This was Days 16-20 of a fabulous Fall road trip a couple of years ago. This leg was Seattle to Ellensburg to Pullman, Washington — 289 miles. If you fly, Spokane is the closest airport. Holiday Inn Express, Pullman, $121/night with a AAA discount + $20/night pet fee. Nice, recently-renovated hotel. Big room; lots of green space to walk the dog, and they don’t mind if you leave the dog in the room (they even give you a tag for the door that says Do Not Disturb/Dog Napping) (love that!). Located close to Washington State University, so be sure to book in advance on football game weekends. This is football country! 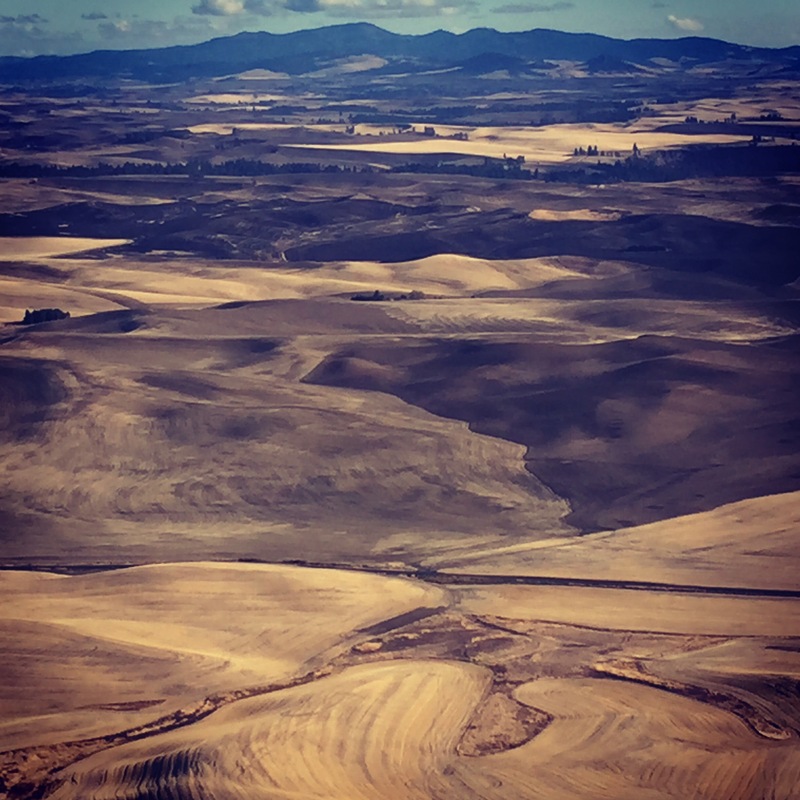 I’d wanted to visit The Palouse, famous for its photogenic landscapes, for years and finally made it part of my long roadtrip home (the move from California back to my home state, Missouri). Most photographers visit in the spring when the rolling hills of eastern Washington are like green velvet, but I think Fall in The Palouse is absolutely gorgeous, in a whole other beautiful way. I was there towards the end of October, long after the wheat harvest, and I used Pullman as my headquarters and spent 4 days wandering aimlessly around The Palouse, which I highly recommend. If your time is more restricted there are lots of local photographers there who offer photo tours, but I really enjoy wandering. Fair warning: I include a LOT of highway shots from behind the wheel. I do it to remember the journey, and hopefully share the thrill of discovery. You can discover the beautiful red barn when I do, resting peacefully just off the highway in a beautiful field, or perched precariously near the highway curve because it was there long before the highway interrupted. 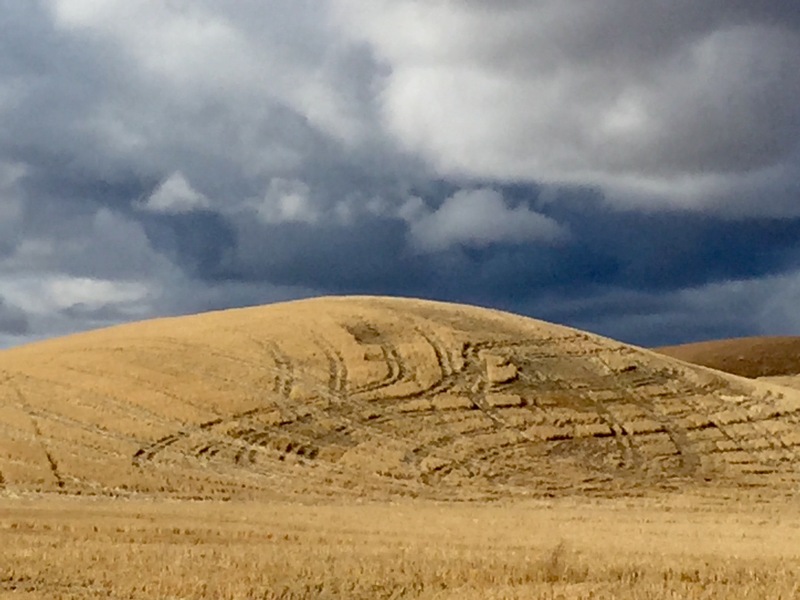 … but the rolling hills of the Palouse in eastern Washington are the greatest producers of wheat in the United States.